This was a hard book to read and I think it will be hard to review. I think, for the most part, I enjoyed it, but there were a few aspects that kept me from loving it as much as Buxbaum's debut. 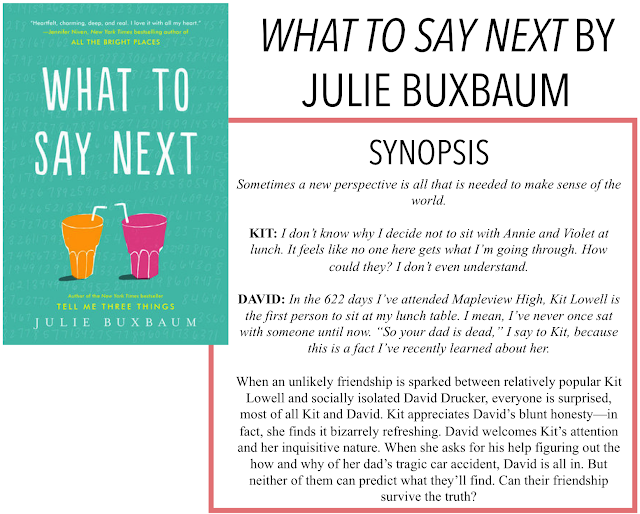 I am back with another book review, today it is What to Say Next by Julie Buxbaum. This story follows David, a social outcast who is on the high functioning end of the spectrum, and Kit, whose father recently died in a car accident and is struggling with her grief. One day, Kit sits at David's table for lunch and, while initially struck by his brutal honesty, finds it refreshing. Soon the pair is working together to get to the bottom of Kit's dad's car crash, but as secrets are revealed, feelings are hurt, and their relationship may never be the same. I have to say, I'm a little torn with this book. Part of me is really excited to read a book with so much diversity - both in David and Kit. David's character provides neurotypical diversity, and Kit's character provides both racial (she's biracial, half Southeast Asian Indian and half American) and body diversity. However, this commentary on diversity, specifically in David's case, comes from an ally, not an #OwnVoices author. While I think it is really important to hear these stories, I can think of many other authors who may be more, I guess, qualified, to write about characters on the spectrum. BUT, I'm glad Buxbaum took the time to do her research and write David's character. At the same time, looking at Kit's diversity, it just felt a little off. Especially the body diversity. Even though there was this emphasis on Kit not being super thin, or looking like all the other girls, there was a lot of awkward discussions about weight and a lot of girl-on-girl shaming. Even Kit's mom, who gave her back-handed compliments, didn't seem genuine. If you break this book down, it's really quite good. David is a great character, his relationship with his sister and parents is phenomenally done. Kit is a decent character, sometimes I found her a little annoying, but for the most part tolerable. The slow-burning romance was well done as well. Individually, these things work, but together, I just feel like something is missing. In all honesty, I almost put this book down. I don't know what happened with the writing style from Buxbaum's debut to this one but I found the story dragging on. It's less than 300 pages but it felt like twice that. The dual narration was fairly well done but I found some moments were I was confused on who was narrating at some points. David and Kit generally had distinct voices, but they occasionally blurred. There was, of course, a big plot twist that ripped David and Kit apart (what would a romance novel be without it?!). I was initially surprised, but looking back, I'm pretty sure we find out what happened early on. That ruined the ending and the drama for me. Overall, I just didn't love this one as much as I wanted to.